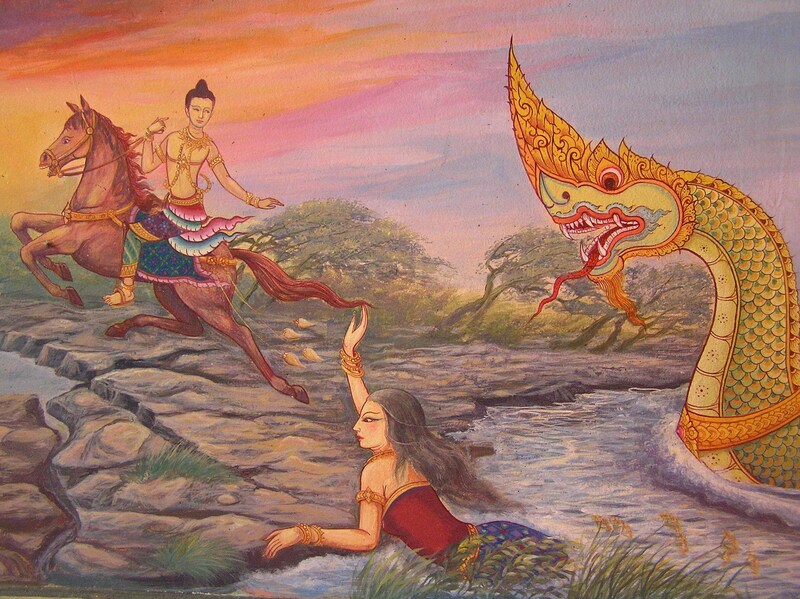 Encounter with NongKhai's Legendary River Serpent! Growing up in Minnesota with its the Land of Paul Bunyan influence, mystical folklore was just a natural part of my culture. As a young boy prone to believing in strange monsters hiding under my bed, long haired Norwegian trolls living under the bridge north of my folk's farm, and gigantic red finned lunker musky swimming in the lakes, myth and reality often became intertwined. Interestingly enough, the two still do! So when I heard people in Northeastern Thailand softly whisper about an enormous, mysterious and revered serpent living in the nearby river, my imagination was sparked and my curiosity immediately peaked! As I began looking into this historically influential creature, I found that mighty rivers are often a powerful source for creating legends and myths. Frequently, these stories are based on some historically distant fact. The Mekong River that starts its two thousand kilometer journey in the cold mountains of Mongolia, passing through tropical Thailand on its way to the sea, is no exception. Deeply embedded in the Buddhist way of life, as well as the local folklore of Northeastern Thailand, is the story of a gigantic river serpent living in the depths of the Mekong River near the city of Nongkhai. Fact and fiction are often difficult to separate, especially when history, religion and culture are all involved. I heard passionate stories from people who said they'd seen the river serpent. I'd seen old, colorful paintings of it in the temples. I'd touched some of the statues that form such a basic part of temple architecture. Was everything I'd heard, seen or touched, simply legend or were all these things, a way of recording historical fact? 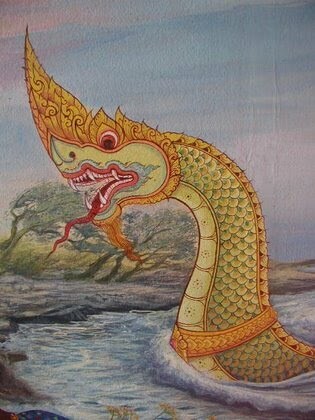 Whether the river serpent is fact or fiction, the reality is that people in this part of Thailand say that this strange, supernatureal creature influences every aspect of their daily lives. 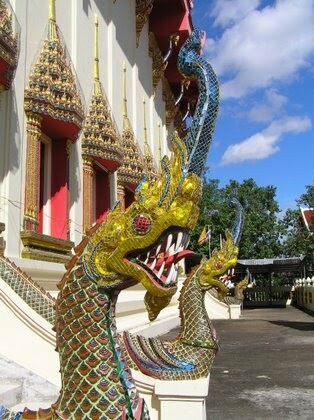 The entrance to Buddhist temples is guarded by these enormous, snarling river serpents. Frequently, the Lord Buddha statues within the temples have the tempestuous looking serpent rising up to protect them. The architecture of peoples' homes incorporates the river serpent into the design of the roof decorations. Parents recount the legend to their children, grandparents to their grandchildren. And every year, thousands of people flock to the Mekong River near Nongkhai to observe the supernatural phenomena attributed to the famous river serpent. 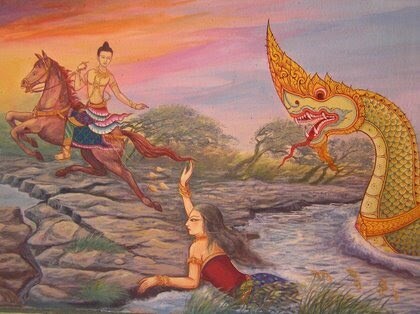 Locally it is believed that in Muang Badan, a massive underwater city the size of the whole Province, there lives a huge river serpent called "Phaya Naga." or the King of the Naga. From all accounts, this creature has a massive dragon type head with a large round, snake-like body. Ancient paintings in Buddhist Temples indicate the body to be much, much bigger than that of a very large horse. Its length is pretty much undeterminable since the King of the Naga is a water serpent and stays in the Mekong River. However, if the photograph taken by US soldiers at a military base in Loas is any indication of its length, the King of the Naga is truly of gigantic proportions. In the early 1970s, US soldiers captured a Naga creature, which as the picture indicates, measured well over 24 feet in length. This was an ordinary young Naga with a small parrot like beaked head. What these soldiers photographed almost 30 years ago, appears to be just an adolescent naga and not the enormous, colorful, and legendary centuries year old King of the Naga that lives in the river, close to where I was teaching English for the summer. From all accounts, he King of the Naga is a beautiful, yet awesome, fierce looking creature. The huge head sitting on the scaly serpent like body is enormous. Its wide mouth is filled with long sharp white teeth and a slender red tongue. The eyes are wild, dark and penetrating. A fire-like tuft sits atop its angry head and a short flowing beard grows out of its lower jaw. Long slim unruly cat-like whiskers flow from its upper jaw, past what look like tiny ears but are actually a continuation of the tuft on top of its head. Its cheeks are large and puffed out as if it has the ability to spit shooting flames of burning hot fire. The body is long, a mass of toned muscle. This is a body that is extremely powerful, one that appears to be able to move with incredible speed through the water. The Naga gives the impression it is ready to strike at a moment's notice, capturing its prey in its powerful jaws, wrapping its muscular body around that of its victim and instantly crushing every bone. Building on and enhancing its fierce appearance, the King of the Naga is a very brightly multi-colored reptilian creature, with a dark green back, brilliant red belly and scales which show just a hint of gold as the sun reflects off them. Its face is a golden yellow with black whiskers and red highlights around its mouth, beard and crown tuft. A series of small yellow dorsal fins runs straight down the top of its green back. A similar, but smaller yellow fin, runs down the middle of its red belly. It wears a spectacular gold necklace in which is set an ancient sparkly and extremely rare gemstone. This creature, even with what appears to be an extremely vicious temper, is in fact truly beautiful to look at. This magnificent creature is also the one that is believed to cause a strange natural phenomenon that happens only in Nongkhai, and only once every year. It is also the same amazing creature that for centuries, the local people believe, has been guarding the sacred bones of Lord Buddha that were lost in the Mekong River while in transit from India to Thailand. In spite of its wild, angry, and incredibly scary outward appearance, the King of the Naga is not a creature that invokes fear in the local people. Rather, it is revered and looked up to, since as the people in this part of Thailand believe, it worships and protects the earthly remains of Lord Buddha. It is because of its protective nature and guardian care taker characteristics that Buddhist temples incorporate naga statues into the design of the buildings. Every temple I visited in the Northeastern part of Thailand had at least one naga statue. At one extra-ordinary temple I visited in Nongkhai, there must have been hundreds of beautiful guardian green and red nagas. Massive green naga bodies forming the foundation of the temple, ten to 15 foot high nagas forming a powerful fence around the temple, numerous naga forming the door frame to enter the temple, plus naga river serpents carved into the wooden door, the rafters, windows. I was unable to enter the temple, but was told that there were even more naga figures inside the building. There are people, including high ranking Buddhist monks, who convincingly state that they have seen the Naga with their own eyes.. For one 40ish year old woman I spoke with, her encounter with the King of the Naga, initially put her into a near coma state for a week. Following her face-to-face meeting with this powerful creature her life was totally changed, her career, her lifestyle, her basic spiritual beliefs. Most people, however, only observe the mystical aspect of this legendary creature one night a year. For one night, and one night only, the King of the Naga shoots red and pink fireballs into the night sky from far beneath the surface of the Mekong River. This unique, colorful exhibition by the King of the Naga last only for a couple or hours and then is gone. The supernatural display by the King of the Naga takes place the very last day of Buddhist Lent in October. Buddhist Lent lasts for 3 months. This is the Rainy Season, when monks much stay at only one temple for the entire period of Lent. This 3 month period is when it is believed Lord Buddha went to heaven to preach to his mother. The Buddhist historical record states that on the last day of Lent, a gold and silver bridge was created for Lord Buddha to return to earth from heaven. Buddhist along the Mekong River believe the gates of heaven, earth, hell and the underwater are all open this day, allowing the Nagas to worship Buddha with their fireballs. Two prominent monks in Thailand have explained part of the fireball phenomenon in this way. Traditionally, the local people would make torches made from insect waste collected from trees. These torches would then be placed on 50 to 90 foot long poles on their boats. The floating fireboats were the local people's way of expressing their respect and tribute to Lord Buddha. In order to make their boats even more spectacular, the people fired small handmade rockets (Ban fai) into the night sky. It was with the addition of these rockets, that an unexplained phenomenon occurred, rockets were fired from under the water, as if the King of the Naga wanted to participate in this end of Buddhist Lent event. The mysterious, colorful fireballs appear from 6 p.m. to about 2 a.m. on the last day of Lent. Sometimes as few as 50 may appear during the one night celebration, while during other years, thousands may shoot some 60 to 100 feet into the air. The fireballs can come from near either the Thai or Laos banks or from the middle of the river. The strange fireballs light the night sky, then disappear without any noise or smoke. Thousands of people come to Nongkhai every year to participate in this event and observe for themselves the supernatural appearance of the King of the Naga. I would have loved to have been in Thailand this coming October to observe this supernatural event myself, but, that's a busy time for new teachers in California. The beginning of the school year is when I spend a lot of time assisting the newly hired Special Education teachers in Rialto Unified School District. Maybe when I retire, a visit to the Mekong River in October could be my way of celebrating my teaching career! So knowing that my stay in Nongkhai was coming to an end, I biked down to the Mekong River to say goodbye to some friends and to spend a little time meditating next to the river. I'd often seen a young monk meditating there at sunset, and on a number of occasions had followed his example of focusing on my breath as the sun would set. Sitting on he banks of the slow moving Mekong River can be very peaceful and relaxing. A few hours earlier, a big thunderstorm had moved through Nongkhai and was now just across the river making its way slowly into Laos. What an extravagant sound and light show nature put on for me as I watched the lightening flash across the sky, followed by the deep resonate rumble of distant thunder. If the distant tropical monsoon rainstorm was not enough, the setting sun made a spectacular appearance as it dropped through the clouds and over the horizon. Rarely have a seen a sky so beautiful as it was that evening. The horizon was filled with large white, gray and black cumulous clouds that billowed high into the early evening sky. Dramatically the sun would peak through these clouds, sending long yellow shafts of glimmering rays, overlaying them against the clouds which were turning from the pastel shades of pink, blue and white to deep crimson red and orange. It was the type of visually and emotionally charged sunset, that as a kid, I always envisioned as the celestial backdrop the second coming. Because of the rain and the intense heat still coming from the setting sun, the evening was stifling hot, with near suffocating humidity, and not the slightest breath of a breeze to stir the air. The river was mirror calm, perfectly reflecting the colorful clouds and the beautiful setting sun. From the corner of my eye, I saw movement on the water's surface near the middle of the river. At first it was hardly noticeable. Then the disturbance below the water's surface grew larger, creating a mass of ripples that began traveling faster and faster toward the banks of the river. Suddenly from the very depths of the wide muddy Mekong, the whole river seemed to explode upwards, as the water began to boil violently. Involuntarily, I fell backward against the damp riverbank. From one side of the river to the other, the water churned, frothed and swirled with a terrifying, massive earthquake type magnitude and force. Out of the brown foaming muddy waters, the section of a large dark green undulating body surfaced for a couple seconds, its sides briefly catching the sun's reflection giving it a gold shimmer before its sleek smooth body twisted and rolled sideways, exposing the red belly underneath. Then, the creature slipped back under the broiling water surface. I sat totally frozen. I couldn't breath. I couldn't move. I felt my heart racing. My muscles were tense, tight, strained to exhaustion. My heart was pounding so hard in my chest, I feared for my life. All my senses were on their absolute highest alert. My body ached and tingled at the same time. That's when it happened... another huge eruption of foaming muddy water boiled massively upwards from somewhere near the middle of the river. Out of the foaming, turbulent water shot a mammoth yellow and red dragon-like head, pushed higher and higher skywards by its enormously muscular green and red serpent like body. Riding high in the water, the creature was racing downstream away from me. I wished my heart would stop pounding as I held my breath, not wanting to make the slightest move that could possibly attract any attention to me what-so-ever. But my luck did not hold. In complete shock and absolute terror, I stared out at what was happening in the hectic churning river before me. In the blink of an eye, the creature had suddenly changed direction, and at a break neck speed, the serpent was charging straight at me. I was petrified, I laid there motionless, scared to death. I couldn't even trust myself to look directly at the creature I was so scared. From the corner of my eye, I could see the angry serpent violently tossing its head back and forth as it got closer to the bank. Water flew off its whiskers and beard, drenching me. Still I could not, dared not move even a muscle. Its huge wet body slid to a stop right at the water's edge, immediately in front of me. I could feel the cool air coming off its body caused by its abrupt stop. Without a sound the serpent reared its dragon-like head high into the night sky and stared directly down at me with those incredibly wild black, piercing eyes. For what seemed an eternity, those ancient eyes stared down at me. I lay on the bank totally immobilized by fear. I had no idea what this angry looking creature might do next and was deathly afraid to speculate, for those eyes seemed to bore right into my very being. My brain felt as though it would explode, my heart was pounding so hard. I wished my body into action, but my arms lay dead on either side of me. My legs lame, lifeless. I couldn't even feel my toes. My jaws were so firmly clamped together, I thought my molars might crack. And still, the unearthly force of those intense black eyes firmly pinned me to the damp bank of the river. Then, a brilliant flash of light from the setting sun's reflection off the creature's water drenched head, temporarily blinded me with its glare. With a mind deafening crash, the huge river serpent fell back into the muddy brown river. Its mammoth sized head and powerful body cracking the water's surface, before silently slipped back into the river. It was gone. The Mekong River became calm again. 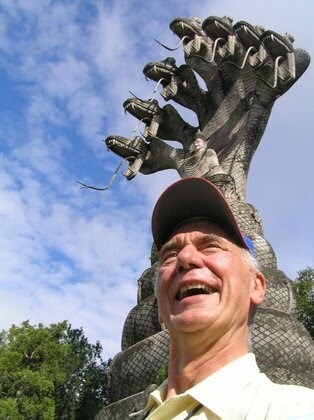 Post script to The King of the Naga: Hours later, probably still in shock, I lay in my bed unable to sleep. By now my heart had stopped pounding and the tips of my fingers no longer felt numb. Blindly, I stared through the pink mosquito netting at the dark ceiling overhead, trying to understand my unearthly encounter at the river earlier that evening. My mind struggled vainly to make some sense out of what had happened. All night I tossed and turned, unable to sleep, unable to get comfortable as I lay on my paper thin mattress, the only thing that separated me from the hard wooden floor. The soft resonant sound of the 6 o'clock bell being rung by a Buddhist monk at the local temple gently awakened me from what must have been a very light sleep. The bell announced it was time for the monks to walk out into the community to be given the one meal they would eat for the entire day. Lightening fast the events of the previous evening flashed through my still frazzled brain. My mile or so bike ride past the rice paddies on my way to the Mekong River. The heavy monsoon rains falling over Laos followed by a spectacular and dramatic beautiful red sunset. The incredibly oppressive humidity as night approached. The calm, peaceful river turning into a caldron of foaming, boiling muddy water as the glistening side of a monster sized serpent emerged and then quickly disappeared back under the water. The fierce yellow dragon's head shooting straight up out of the river, creating a small tsunami that sped toward the bank. The mammoth green body crashing downstream through the water, only to change course and come charging directly at me. My initial feelings of fright turning to absolute terror as the creature came to a halt immediately in front of me, its wrathful head towering high over me. The wild eyes, those incredibly intense, penetrating black eyes. Eyes that stared down at me from behind a gaping mouth filled with razor sharp teeth. The ear shattering crash as the enormous serpent fell back into the river, then silently slipped into the murky water. On the most superficial level, my brain seemed able to compute simply that something incredible and extraordinary had happened to me. To say my experience had been a once in a life time experience is probably a bit of an understatement. But at the time, that was about all my mind could handle. On a much deeper level, as my brain began to clear, I felt blessed. No, not blessed in the sense that I felt relieved by the fact the creature had not drug me unceremoniously deep into the river only to crush my every bone. That wasn't it. There was something more, something just out of my feeble mind's reach. Yes, I indeed felt very blessed to still be breathing, to just be alive. But it was more than simply having a pulse and not being either on the critical list at some local hospital or inertly lodged against a slimy boulder at the bottom of the Mekong River. Laying in my bed, my mind kept searching and searching for some answers, but none seemed to emerge from my overly befuddled brain. The final ring from the temple's early morning bell resonated through my room. For a split second, as that last soft gentile ring slowly drifted off toward the Mekong River, I saw again those piercing eyes of the ancient, protective river serpent I'd encountered the night before. In that fraction of a second, I knew that the very same fierce river serpent that for centuries had guarded the sacred bones of the Lord Buddha, now stared directly into my eyes, penetrating the depths of my very being. I had encountered the King of the Naga, and I experienced the unexplainable.